Besides updating status on Facebook: uploading, sharing, viewing and commenting on photos is favorite activity among Facebook users. Any Facebook user can upload unlimited number of photos on their account. You can view own uploaded photos and images uploaded by your friends on Facebook. Photo viewing and sharing being one of the primary activity on Facebook, lot of users face problem with image display and viewing. Do we have problem with all photos not appearing on Facebook website? It means, Facebook webpage is loading but not a single photo in the newsfeed, uploaded photos, friends photo is being displayed. 1. Web browser issue – It could be due to issue with web browser being used to access Facebook website. For example: if you are facing issue in Internet Explorer, try to check if issue occurs in other browser like Google Chrome, Firefox. If images appear fine in other browser, then we need to troubleshoot problem with web browser. However, if issue persists in every web browser – then it points to issue with Facebook website and your account settings. You can start by checking “Secure browsing” settings” as explained below. 2. Check secure browsing settings – Now content on Facebook served using more secure https format. This sometimes can cause problem of images not displaying properly. You can revisit on secure browsing settings of your Facebook account to check on the issue at hand. Click on down arrow button and then click on Account Settings option to open Facebook’s settings page at facebook.com/settings URL. Now click on Security tab and check “Secure browsing” option at top. Click Edit button and then uncheck (no tick) “Browse Facebook on a secure connection (https) when possible” option. Then click Save Changes button and now check for photo display issue. 3. Technical problem with Facebook – Like many websites, Facebook also face technical problems resulting in downtime. A temporary image viewing problem could be due to technical back-end issue with Facebook website (or server hosting it). You can check with friends via Twitter, email and other social websites to confirm if Facebook website is working or not. Also, there are number of online services to check if Facebook is down due to some maintenance, error or updates. In some cases, all images may be appearing fine except for few selected photos and photo albums on Facebook website. Following are few directions you can explore to find fix to such issue of specific photos not visible. 4. Cannot see photos in specific album – No photos appear when you open specific photo album on Facebook. This happens when access to photos in that album is restricted by user who uploaded that album. Your friend may have assigned strict privacy settings to specific album and disallowed you from viewing photos inside that album. If this issue is happening to photos you have uploaded in a specific photo albums, then you should wait for few hours for images to re-appear. Sometimes, due to website maintenance certain photos or albums temporarily disappear. 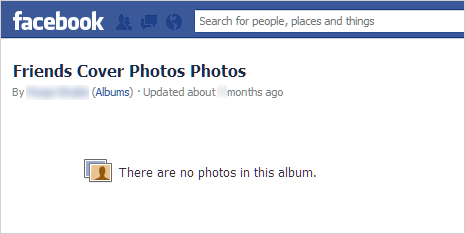 If photos are still missing after few hours, you can contact Facebook to get help fix this issue. 5. Specific photos not visible or appear pixelated – Are specific photos uploaded by you disappeared from your Facebook account? In this case, you can directly contact Facebook to follow up on the issue. Also, there is dedicated contact form to check on the issue of specific photos appearing blocky or pixelated.